When you learn how to cook leeks, you will not find too many dishes consisting primarily of leeks. It is one of those vegetables that has a lot to offer as far as flavoring other ingredients. Since its water content is lower than onions it works well in many dishes such as stir fry and omelets. Leeks have a mild onion flavor. The white part of the leeks and the light green are the edible parts. Most of the darker green will be discarded because of lack of good flavor and more of bitterness. If you are learning how to cook leeks, you can use them much like you would use onions. When fresh, you can chop them and sprinkle them in salads or over dishes like mashed potatoes. Sauté chopped leeks with green peppers or mushrooms to serve with steaks and other meats. 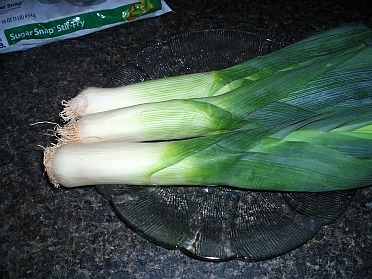 They can also be chopped and boiled in soups and other dishes when you learn how to cook leeks; frying makes them crispy. The thing to remember about leeks is to chop them or slice and separate the rings; they can become long and tangled if not done. Wash and trim leeks. Cover with boiling water, add salt and cook for 15 minutes. Drain. Arrange in a buttered baking dish. Sprinkle with pepper and cheese. Heat under broiler until cheese is melted. Preheat oven at 350F degrees. Mix spinach with ¾ of the cheese, all the soup, leeks and egg. Spoon mixture into a greased casserole dish. Sprinkle with the mushrooms and then the crumbs mixed with the remaining cheese. Cover with foil and bake for 30 minutes. Sauté leeks in the oil in a large skillet until tender. Cool. Combine eggs, cheese, salt and pepper. Stir into the cooled leeks. Pour into a greased 10 inch pie plate (fairly deep plate). Bake for 30 minutes or until set in the middle. Separate grape leaves and drop in boiling water; cook 5 minutes and drain. Season sardines with salt and pepper; wrap each fish in a grape leaf leaving head exposed. Arrange wrapped fish in crisscrossing layers seam side down in deep pot; sprinkle each layer with mint. Mix onion, leek, tomato, garlic, oil, wine, paprika, salt and pepper in a bowl; pour over the sardines. Bring to a boil, cover and simmer for 25 minutes or until sardines are done. Place contents of pot on a large platter; remove grape leaves and serve 3 on each plate. Spoon sauce around the fish on plates; add a grape leaf as garnish.